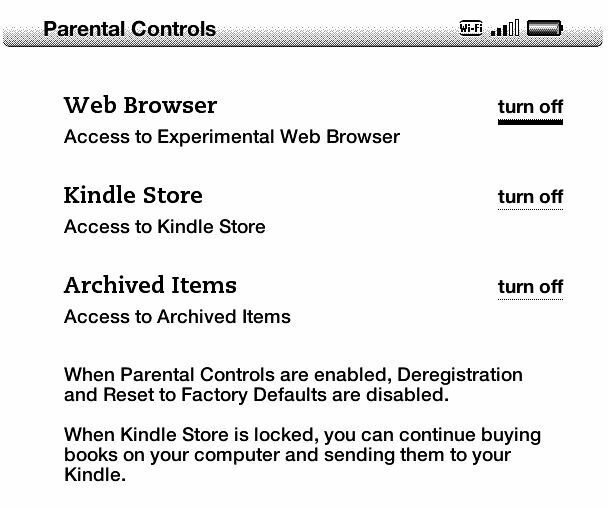 Basic Kindle, Paperwhite and now Kindle Keyboard (3rd gen) with recent updates have 3 options for parental control: Experimental Web Browser, Archived Items, and the Kindle Store. Go to Menu, settings then scroll through to get to this section. They are independent, so you can block 1, 2 or all 3 of these. If you block Kindle store, you can still buy through a computer and send books to the Kindle. 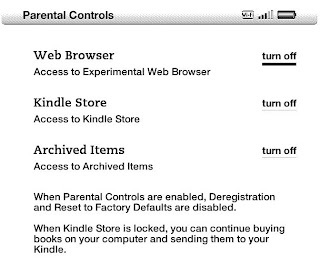 This means you can control what the kids are buying without de-registering the kindle completely. If you didn't receive a recent update, see the Update Page for details. For past tips, see the menu at the top of the page!